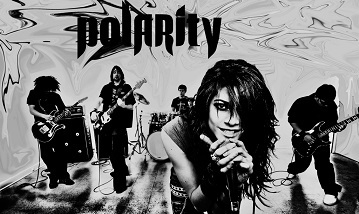 POLARITY is a band that stands out and stands alone, musically, vocally, lyrically and live. Reflecting the meaning of their name they embrace duality while striving to find balance in the light and dark of life. They create Alternative rock with both aggressive and etheral elements. POLARITY has been a fixture on the Independent music scene their formation and album release in 2009. Global Entertainment described their 2009 album as going ‘basement gold’ and they proudly sold over 2000 copies independently while touring to the East Coast of Canada. With their 2011 EP songs allow you a moment to breath and linger in a state of melodic limbo, listen for harmonizing guitars and painfully insecure lyrics. Once you’re comfortable and before you know it you’ll find senses exploding with pounding rhythm, powerful rifts and strong yet vulnerable melodies. In the upcoming months you’ll find POLARITY on the road touring the United States of America on a 30 + date tour. Upon their return they’ll continue playing to Canadian audiences expanding their following and writing new music. POLARITY aspires to inspire with meaningful lyrics and music made from soul. They aim to provide audiences with a unique musical experience which they won’t soon forget.POLARITY; The positive or negative state in which a body reacts to a magnetic, electric or other field. This definition sums up all they can ask from potential new listeners. They ask that you give into their moment and allow yourself to feel the magnetic pull of their unique style. Allow the electricity of their instruments to course through your body and embrace the positive or negative reaction you have to the field of music they create.